PlayStation has just announced the PlayStation Hits range , a selection of more than 20 PS4 games discounted to only 19.95 euros . We tell you all the details below. 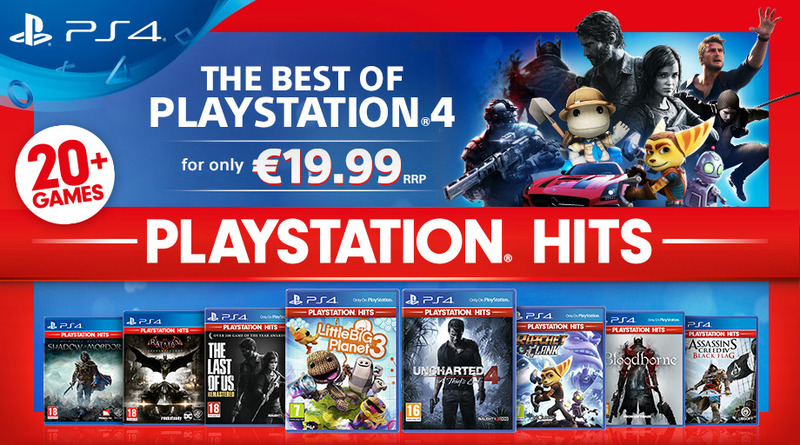 So that you do not stay without playing the most acclaimed PS4 games , PlayStation has just announced the PlayStation Hits . It is a selection of the most prominent games and they are available in the Sony console at a new price: 19.95 euros. It should be noted that you can buy the games both through the digital store of the console and some selected establishments. The list of games that will be available on July 18 is as follows. Death has many faces, but none as attractive as Bloodborne’s . Hidetaka Miayazaki took command of this bestial project exclusively for PS4 that took up the benefits of the Souls saga and put them into practice in a completely new universe, which is at the same time a tribute to the horror of Cthulhu and the blood. Evolution Studios again demonstrated its good hand for the genre of speed by reinventing itself with DriveClub , as competent as WRC and Motorstorm were. The social component of the game is a success and, technically, is the best there is in PlayStation 4 , to which we must add a control that, despite being fairly standard, manages to catch the driver. The development of inFAMOUS Second Son follows the formula of the saga: we have a huge open environment at our disposal to explore, go for the main missions or else “get lost” with secondary tasks. If to the above you add that it is one of the most interesting games of a console, you have before you a title that, if above is the superheroic roll, you can not miss. Developed by Guerrilla Games , creators of Horizon Zero Dawn , Killzone Shadow Falloffers an interesting multiplayer, a technical section with great details, good control and an attractive plot, resulting in an interesting journey full of, in addition, remarkable graphics effects. One of the best games of the last generation is also one of the best PS4 games. The Last of Us Remastered tells the odyssey of Ellie and Joel in a world without a future or hope for humanity, with a technical section set up for the occasion, and with the fantastic Left Behind DLC included. Developed by Sumo Digital , LittleBigPlanet 3 is the third installment in the series starring Sackboy that combines puzzles, platforms and level creation, and also adds three new characters, each with their own abilities. Ratchet & Clank is a remake of the original Insomniac Games video game released in 2002 for PS2. It is an action game in the third person with elements of platforms, puzzles and RPG, becoming an adventure for PlayStation 4 that combines several genres. Nathan Drake lives his last great adventure in better shape than ever. The guys from Naughty Dog have managed to surprise us again with this Uncharted 4: The outcome of the thief , showing that they are capable of creating the best PS4 game we could imagine. A “must have” in every rule. Need For Speed is a complete reboot for the franchise with a huge open night world and the return of the urban culture of cars. This new Need for Speed ​​also allows more personalization options than ever before and has an immersive narrative that reflects the culture of speed. The highlight of this Need For Speed ​​Rivals is that he finally managed to integrate the multiplayer with the Career mode alone. An idea that has already been tried in some other previous speed games (both EA with its Autolog and others of the competition), but here it works effectively. EA Sports UFC 2 is the new edition of the electronic sports fighting saga that offers new animations for fighters, a new system of physics and new game modes such as career mode or UFC Ultimate Team. In addition, in EA Sports UFC 2 we can enjoy Ronda Rousey. Developed and edited by SEGA , it is the prequel to the Yakuza saga. Yakuza Zero is an action adventure in third person and open world in which apart from the main plot, we have a great freedom to perform other side missions or mini-games. The game features voices in Japanese, and texts and subtitles in English. Earth Defense 4.1: The Shadow of New Despair is a futuristic shooter that offers us to face huge amounts of aliens with the sole intention of conquering the planet Earth. The fans of the world of motor and video games were awarded in 2014 after a long wait with the launch of the sensational Project Cars . The guys from Slightly Mad Studios gave us one of the best driving simulators of all time, able to look at Gran Turismo one on one . Anyone who is a fan of the Saiyanos has a huge park to play with Dragon Ball Xenoverse : learn little by little the techniques that have blown us in the manga, spend zenis in buying a beard like Mutenroshi’s or see the great duels from a very different perspective. All a joy for those of us who have always wanted to launch our own Kamehame as Goku. Dynasty Warriors 8: Xtreme Legends Complete Edition is the version that combines in a single game the content of Dynasty Warriors 8 and that kind of expansion that is Xtreme Legends . An edition that fans can not miss. Watch Dogs is an entertaining adventure, deep and well set. A very remarkable sandbox, long and full of extras that, if you like, you can continue enjoying its sequel: Watch Dogs 2 . Assassin’s Creed IV Black Flag is a very entertaining adventure. Probably not convince you if the saga you have never liked, but if you are one of those who build a dagger hidden with silver paper, you will enjoy as dwarves with this delivery. Developed by NetherRealm Studios and edited by Warner Bros. Interactive Entertainment , Mortal Kombat X is a 2D fighting video game with 3D graphics that stands out for the explicit violence of their battles, including the fatalities that popularized the saga. The Dark Knight has returned in style with Batman Arkham Knight , game called to put an end to the sensational saga Arkham RockSteady . The Batmobile took all the protagonism of this adventure full of emotion, broken bones and gas of fear. Middle Earth: Shades of Mordor is a sandbox that had the courage to bring new and very interesting ideas to the formula. His main story may not be the best or the most original in the world, but his Nemesis system is responsible for adding a random factor, full of unexpected, that make the experience more alive and organic than in other similar games. Developed and edited by Capcom with the Unreal Engine 4 graphics engine , Street Fighter V is a 2D fighting videogame with 3D graphics. Street Fighter V came out with 16 series fighters, but, gradually, it has been increasing its content, with the inclusion of new fighters and scenarios, apart from alternative costumes and more game modes. We remind you that you can take advantage of the PlayStation Hits, a selection of more than 20 PS4 games discounted to only 19.95 euros, starting next July 18 and that, very soon, PlayStation will add more games to the selection. Until then, we leave you with our report on the 20 best games for PS4 .